The latest software upgrades of Polycom Trio and Group Series solutions brought about their integration by which Polycom Trio gained a large number of new functionalities. In our previous articles we have already written about, everything Trio can do and in which spaces it gives its best. Its main drawbacks were that the video signal could only be displayed on one monitor (Visual+ has only one HDMI output), it had no automatic camera control (EagleEye Director 2 or Producer), no ceiling microphone connection, no HDMI input for PC… All these shortcomings used to be the reason for switching to the Group Series codec, but now you can have all these features with the Trio 8800 and Trio 8500 solution. 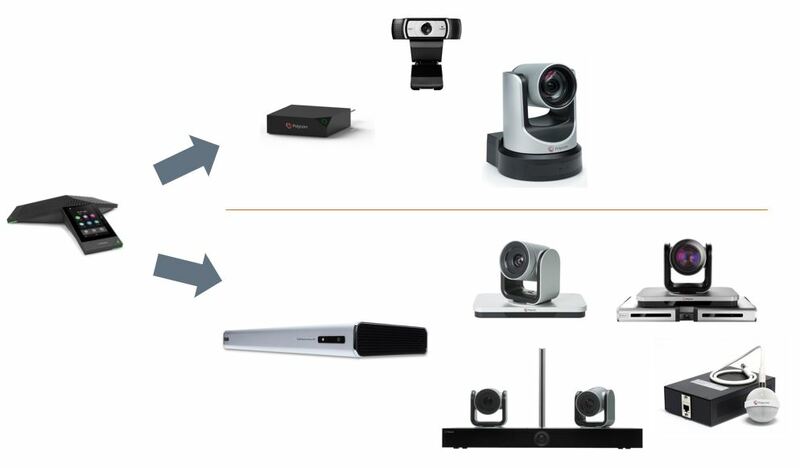 To make the Trio audio conference device a video conference device you needed to connect a Visual+ unit and one of the two available cameras (Logitech c930e or EagleEye IV USB). With the new upgrade, Trio can, in addition to the Visual+ unit, now be integrated with the Group Series codec (supported models include 310 and 500), thus gaining the ability to display video signal on 2 monitors, offering an option to connect systems with automatic camera control (EagleEye Director 2 or Producer), EagleEye IV 4x and 12x cameras, as well as ceiling microphones, and providing VGA/HDMI inputs for PC. Moreover, the Group Series codec enables the use of VbSS to send PC content to the far end. In this mode, Trio is the brain of the solution, while Group Series serves as a peripheral interface.